Jair Bolsonaro ended his meeting with US president Donald Trump on Tuesday (19th) in Washington with a win: the United States' support for Brazil's candidacy to become a member of OECD (Organisation for Economic Co-operation and Development), the "rich countries club." It was the primary goal of Bolsonaro's first visit to the United States as president. The Brazilian government sees the OECD membership as a sort of "seal of approval" of its macroeconomic policies. However, the support didn't come for free. In exchange, Brazil will give up its special treatment status at the World Trade Organization, WTO, which allows the country to have better terms in trade deals and other privileges. The trip also cemented Trump and Bolsonaro's relationship and ideology affinities. 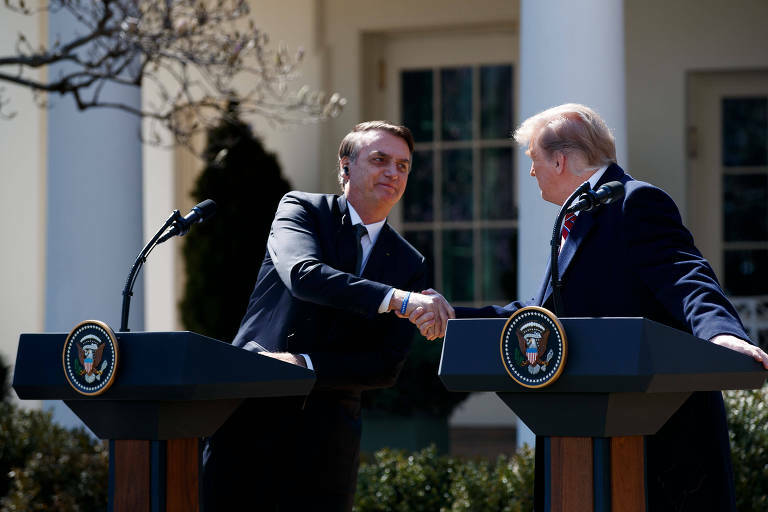 U.S. President Donald Trump (R) attends a joint press conference with his Brazilian counterpart Jair Bolsonaro at the Rose Garden of the White House in Washington D.C.
During the press conference at the White House Rose Garden, they exchanged compliments and jokes, showing their chemistry as right-wing populists. "I have always been a great admirer of the US, and my admiration only grew strong with you as a president," Bolsonaro said to Trump. "Brazil and the United States are united in the safeguard of freedom, fear of God, and against gender ideology, political correctness, and fake news." Trump also didn't spare praises for the Brazilian leader. "You did an incredible job uniting the country. I'm very proud to hear the president use the expression 'fake news.'" The United States is waging war to reform the WTO. One of the main goals is to end the possibility of member countries to define themselves as developing, a label that would warrant them special treatment.